ORIGINAL ARTICLE: Gov. Pat McCrory at a press conference last week: “We have not taken away any rights that have currently existed in any city in North Carolina.” A reporter later asked a transgender rights question related to the new law and McCrory complained he was being blindsided and refused to answer. Blindsided?!! This, from the very same governor that signed the special one-day session anti-trans bill that blindsided every single transgender citizen living in North Carolina? Yes, that one. Politifact.com aptly summed up the whole political mess in their rating of McCrory’s claim as False. The American Civil Liberties Union and Equality North Carolina has filed the first legal challenge against the bill in the form of a lawsuit. 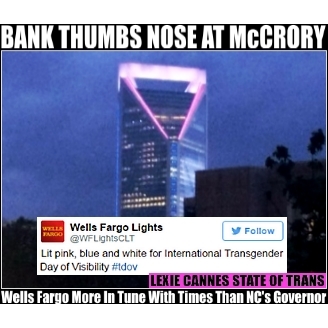 In defiance of McCrory’s ideals, Wells Fargo lit up a 48-story Charlotte skyscraper in the transgender colors. At this writing, over 120 business executives have signed a letter to Gov. McCrory objecting to the discriminatory legislation. According to the Wall Street Journal, these executives include Brian Moynihan, chief executive of Charlotte-based Bank of America Corp.; Apple Inc. Chief Executive Tim Cook; Facebook Inc. Chief Executive Mark Zuckerberg; Cisco Systems Inc. Chief Executive Chuck Robbins; and Salesforce.com Chief Executive Marc Benioff. The Obama administration is looking into whether the law renders North Carolina ineligible for federal funding on schools, housing and highways according to the Seattle PI. McCrory previously stated that the law does not jeopardize the billions North Carolina receives yearly from the federal government, but if a review finds otherwise, the pressure to repeal the law could increase significantly. A recent report in the Charlotte News & Observer noted that medical professionals in the state are now starting to line up in condemnation of the state’s anti-trans law, noting the now enhanced risk faced by transgender kids and adults. Stay tuned, maybe something will get flushed. ‹ Contact List of major North Carolina businesses/organizations. Easy-to-use and please share! The radical religious wrong, who backed this horrible bill, needs to see the horrible backlash they caused for their state. And the lesson learned has gone out to the other states who have entertained such foolish thoughts of passing similar bills. Same lesson for Republican politicians in those and other like states. The radical hater right are few but very vocal and therefore influential. The LGBT community and allies, especially business allies, have to be just as vocal and make sure that legislators are aware of the implications of their hate legislation. Make calls, send emails, tweets, etc., to legislators, that’s how the system works and that’s the only way they know what The People want. The photo is of the Duke Energy building in Charlotte not the Wells Fargo building. I updated the sentence to correct that. Thank you. Governor McCrory said, “I have not had one company say they’re moving out of North Carolina” as a result of the enactment of that state’s anti-LGBTQ law. Well, now you have, Governor. PayPal is dropping its plans to base a global operations center in Charlotte. That’s $3.6 million in infrastructure (according to AP) and more than 400 jobs gone in the blink of McCrory’s bigoted eye. The trans large, vocal trans community here in Asheville NC is turning-out in force. …AND we are doing all this with grace and peace. The other side is coming-off as the bigots they are: mean and disruptive. I live in NC. I am a college professor. I am transgender. The bill signed by Mcrory is a personal assault on me as a citizen and affects my daily life in this state. If this type of ignorant politics is not stopped, I will be forced to move from the state I love. But since Governor Pat McCrory signed HB2, an anti-LGBT bill, into law last month, well over 1000 jobs have been moved out of state, and well over 100 companies have expressed concern or anger, warning they may move or cancel plans to expand, costing the state millions of dollars. Sadly for the good people of North Carolina, it just got worse. The Charlotte Regional Visitors Authority (CRVA) says that the city has lost 13 conventions – four definite cancellations, another nine more “lost possibilities” – because of HB2, according to local NBC affiliate WNCN. HB2 is the expansive anti-LGBT law Republicans forced through the General Assembly and Gov. McCrory signed in the space of 12 hours. Not only have 13 conventions decided against coming to Charlotte, but “there are at least 29 groups who say they are hesitant or concerned to bring their events and/or organizations,” the CRVA says.